Take a 1.5-hour walking tour of Ground Zero and the National September 11 Memorial, and gain insight into the September 11 attacks on the World Trade Center. A local guide shares firsthand stories of the event and its aftermath while you visit 9/11-related sites such as St Paul’s Chapel, the Fireman’s Memorial and the reflecting pools, an homage to the thousands of lives lost. You may also upgrade your tour to include a pre-reserved ticket to the One World Observatory. Meet your guide outside of St Paul’s Chapel in Lower Manhattan to begin your walking tour of 9/11 sites. In the aftermath of the September 11 attacks on the World Trade Center, New York City's oldest standing church served as a respite for rescue workers and a place of prayer and support for residents who gathered for news of loved ones. Take a look at personal memorabilia and photographs that still hang inside the church, and then follow your guide to the National September 11 Memorial. See landmarks such as Brookfield Place (aka the World Financial Center), and gain a deeper understanding of the horrific events as you listen to firsthand stories from your guide. Visit the Fireman's Memorial, and explore the site where the World Trade Center once stood. 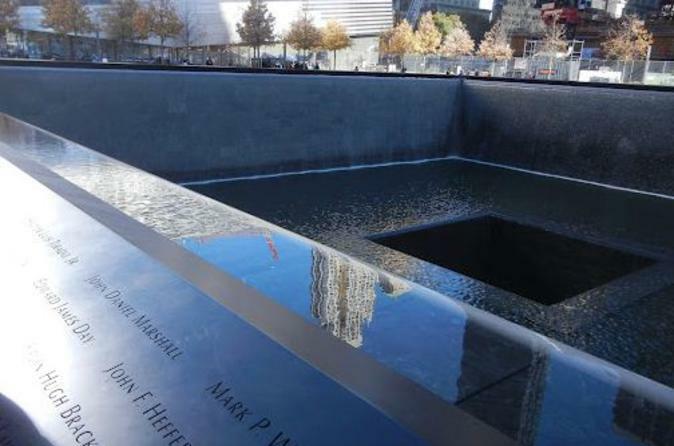 At the 9/11 Memorial's twin reflecting pools, built in the footprints of the former Twin Towers, you’ll find the names of nearly 3,000 victims of the attacks inscribed in surrounding panels. The guided portion of your tour ends at the memorial. If you've selected the upgrade, make your own way to the One World Observatory, which opened in 2015 at the top of One World Trade Center. One World Observatory admission: With a pre-reserved ticket, you won’t have to wait in line, so head straight up to the One World Observatory. Board a Sky Pod elevator to ascend 102 floors in less than 60 seconds, and watch a brief video that dramatically reveals New York City in three dimensions. On the 100th floor, look out panoramic windows from a height of 1,250 feet (365 meters), and step into the Sky Portal, a 14-foot-wide (4-meter) disc in the floor that showcases city streets below in live HD. Then experience City Pulse, an interactive ‘concierge’ that shares stories of the city, its landmarks and neighborhoods via state-of-the-art technology. On the 101st floor you'll find a bar, cafe and fine dining. You may stay at the observatory for as long as you'd like to soak up the 360-degree views of the Big Apple.